PointClub claims to be the best online survey site. But is PointClub a scam or is it really the best opportunity out there, when it comes to paid surveys? I have tested PointClub thoroughly myself, and in this PointClub review, you will get all the details about what you can expect from this site, how much money you can earn as a member, and if it is even legit, so you can easily find out, if it is the right option for you or not. What is PointClub and what does the site offer? PointClub has existed since 2012, so it has been around for a while. It has in a sense been around for even longer, as the site Focusline has partnered with PointClub. Focusline used to be its own survey site, and has existed since 1996. Now it is however a part of PointClub, and not its own site anymore. So in that sense PointClub is a survey site with a very long history. Let me reveal right away that PointClub is a legit survey site. That it is legit does however not necessarily mean it is the right site for you to join. Below I will therefore go over what it has to offer, so you can see, if it is for you or not. PointClub is also called PointClub Surveys, and as the name suggests, it is a site where the main way to earn money is by taking online surveys. It does however also offer a few other ways to boost your earnings. So let’s go over all the opportunities you have as a member. PointClub is a pure online survey site, which means surveys are more or less the only way to earn here. This makes it very easy to use, as it does not have as many distractions as some of the Get-Paid-To sites that offer many ways to earn. Once you are a member of PointClub and are logged in, you can right away easily see, if there are any available surveys for you. So it will not take you any time to figure out how to find the surveys. How many surveys you will get on PointClub depends on many things – among others where you live, but also how your demographic profile fits the surveys that PointClub has at that moment. But if you live in one of the countries, where it is available (see more about this later in this review), it should usually give you a good amount. Be aware that PointClub makes a big effort to make sure the answers they get are of high quality. So if you for example in your profile say you are having a certain income, but then in a specific survey say something else, you risk getting kicked out of that particular survey, as you are not consistent/honest. So the best way to make sure to qualify for as many surveys as possible on PointClub is to be honest. A great extra thing PointClub offers is a high joining bonus you get just for joining and filling out your profile info. You get 2000 points ($2) just for signing up, and then you can earn extra joining bonus by filling out some basic information about yourself and confirming your email. PointClub offers a great joining bonus. In total, you will get a joining bonus of 5000 points ($5), which is a very high joining bonus and very few survey sites offer this kind of bonus. Swagbucks is one of the few other sites that offers this, so it is a great offer and a great way to kickstart your earnings on PointClub. In total, it will take less than 5 minutes from you first join until you have the first $5 in your account. 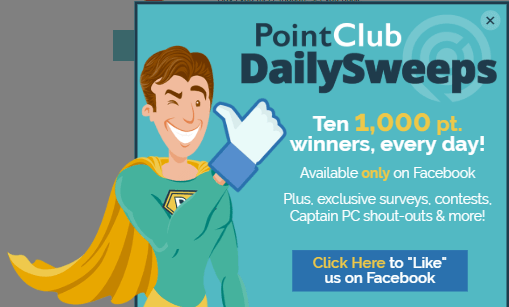 As a member of PointClub you have the chance to participate in the daily free contest. It is a contest that is only available on Facebook. You can find a daily code on Facebook. Every day there will be a posted what is called a SuperCode on PointClub’s Facebook page. You then take this code and paste it into a box on your PointClub account. Put the code from Facebook into the box on the website to participate in the daily free contest. This will enter you into the sweep, and every day 10 winners are picked randomly. The winners will receive 1,000 points into their account. It is not a huge reward, but it is still nice extra money, and it takes very little effort to participate in, so still worth considering to check out the code and use it, if you are on Facebook anyway. PointClub offers something very few survey sites offer. You will get points even when your are screened out or disqualified from a survey. Whenever this happens (and it will happen once in a while on all survey sites) you get 12 points into your account just for trying. It is not a huge reward, but still something I think is great and appreciate, as it is nice you get something just for trying, and it takes away some of the frustration there can be, if you do not qualify for a survey. If you are logging into your Point Club account every day, you will be able to get an extra bonus. This is called the daily streak bonus. The more days you login, the higher bonus you will get. You start at level 1. At level 1 you will get 10% bonus on all the surveys you complete. If you login every day for 5 days, you will get to level 2, where you will get 20% bonus on all the surveys you complete. There is 10 levels in total, so if you login 100 days in a row, you will get a bonus of 100% on every survey you take. So if you are a member, it can be a good idea to make sure to login daily, as it can give a nice extra bonus. If you miss one day, you will go back one whole level, so if you are starting to get to the higher levels, make sure to remember to login every day to keep your bonus level. In addition to getting extra bonus for the surveys you take, you will also get extra point bonuses, as you get to higher levels. I for example received a 1000 point bonus for reaching level 3. So keeping the streak going can definitely be worth it. You do also not need to take any surveys to keep the streak going. You just need to login, so if there is a day you do not have time to take any surveys, or if there are no available surveys on a particular day, you can still continue your streak just by quickly logging in, so it is very easy to keep it going. When you complete a survey on PointClub you get points into your account. These points can then be exchanged into a number of different rewards. You can for example get paid through PayPal, prepaid Visa, get gift cards for Walmart, Uber, Target, TGI Friday’s, Sephora, and many more. In total there are more than 80 different gift cards to choose from, which is a very big amount compared to other survey sites. Personally, I prefer survey sites that have PayPal as a payout option, as this is a great and easy way to get paid in cash, so great PointClub has this option. But it also has many other great rewards, and it is always nice when a survey site offers many options, so it is always possible to find something that fits your preferences. When you get your points, be aware that there are what is called pending funds and approved funds. Your points have to be approved, before you can cash out. The pending funds are points you have made, but that have not yet been approved by the company who ordered the survey. Therefore, you cannot cash these points out until theý have been approved. Approved funds are however funds that have been approved and that you can cash out. You have to earn $25, before you can claim your rewards. This is a little high compared to some other survey sites. However, as PointClub has a high joining bonus of $5, you will still not be too far from reaching the payout threshold after you join. How much money can you make on PointClub? It is very difficult to say exactly how much money you can earn on PointClub. It depends very much on your specific demographic profile, the country you live in, and of course on how active you are and how many surveys you take. One thing I can say for sure is that no matter where you live and who you are, you will not be able to make a full-time income on PointClub or on any other survey site for that matter. But PointClub has some good options and a good amount of surveys, so you will be able to make some nice extra money on the side, and at the same time have your opinion heard. So if you want to make some extra money online, this is a great and easy way to do it, but you should know that it will not make you a full-time income. Personally, I like the option to take surveys on my mobile, as it is a great and easy way to earn a little extra on the go and whenever I have a small break throughout the day. Point Club does not have an app, but you can still easily use it on your mobile devices, as it is fully optimized for this. You just go to the website on your mobile device and login from there. It is very easy to use on mobile phones as well, and as PointClub in general is easy to use and easy to navigate, it is also easy to use on smaller screens. In theory, you can join PointClub no matter where you live. However, it is only worth joining, if you live in certain countries, as the amount of opportunities vary from country to country. In some countries you will not have any available surveys at all, and therefore it would not be worth joining in these cases. PointClub in general has the most opportunities for people living in the US, but it also has good opportunities for UK, Canada, France, Brazil, Mexico, Germany, and Netherlands, among some others. So if you live in one of these countries, it is definitely worth checking out PointClub. If you live in other countries, it might still have some opportunities, but in some countries it will be very limited. However, PointClub is expanding and are getting surveys in more countries continuously, so if it does not give you a lot of opportunities now, it might offer more at a later time. If you need support, you can contact PointClub through a contact form on their website. It is always good to know that it is possible to get in contact with support, if you need it. As an alternative to the contact form, you can also contact PointClub on their Facebook page. They are using their Facebook page a lot and posting more or less every day, and you can send a direct message there as well. From what I can see, they are however not very good at getting back to people who leave comments on the Facebook posts, so if you need to get in touch with support, you should probably not do it by leaving a comment there, but instead by sending them a direct message or use the contact form on their website. I have myself been in contact with PointClub several times, and they have always been fast at getting back, and given good and useful answers, and it is one of the best services I have experienced from a survey site, which is a big plus. PointClub is without a doubt a legit survey site. But let’s sum up the pros and cons, so you can get a better overview before deciding whether it is the right site for you or not. In general, I mostly have positive things to say about PointClub. The only not so positive thing is that the payout threshold is a little high compared to other survey sites. But the pros make up for this, as you get a high joining bonus, it has a good amount of surveys, and it is in general an easy-to-use survey sites with an interactive and fun design. It also offers great reward options, so there will be good options no matter your preferences. Overall definitely a site worth considering, if you live in one of the countries, where it has good opportunities. If you do not live in one of these (or if you want to join more great survey sites) you can check out my lists of the best survey sites in select countries. It is super easy to join PointClub. Just click the link below, and you will be taken to a sign-up form. It only takes a minute to join, and after you fill out a bit of info (takes in total around 3 minutes), you will have a total of $5 in joining bonus in your account. If you have any comments, questions, or have any experiences with PointClub yourself, I would love to hear from you in a comment below. 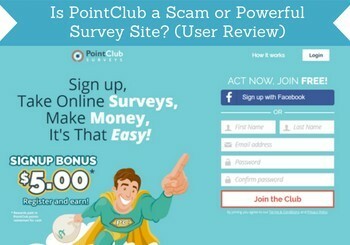 PointClub is a legit survey site with pretty good opportunities to earn by taking online surveys. Especially if you login regularly to get the daily steak bonus. It is easy to use, and if you live in one of the countries where it is available, it can definitely be worth checking out. you didn’t qualify but i promise a sweet victory is within sight! keep working hard. You will unfortunately not qualify for all surveys you are offered. It is very normal to sometimes not qualify for a survey – it happens on more or less all survey sites. So no need to worry about that and then hopefully you will qualify for the next instead. Does this site request verification by phone? No it does not Fernando. This is a good review. My question is, how long does it take to receive the PayPal payment or is it immediately? Another question, the page pays $ 25 when you have 25000 points, in the case that my points fall in revision, how long it will take to give me them? Thanks for the feedback. Glad to hear you like my review. Once you request a payout through, you should receive it within a week. Not sure I understand what you mean about your points fall in revision? Do you mean that you have some points that are pending after you have taken a survey? If that is what you mean, then it should take maximum 2-4 weeks for the points to clear. It depends on the complexities of the survey how quickly the company approves it. Once they are approved, you can, however, cash out right away if you have reached the payout threshold. Hope this helps and let me know if you have more questions. You can in theory join PointClub from any country. But it does not make much sense to join it from Nigeria, as you will not really have any opportunities there. You can instead try for example ClixSense and Toluna. I am not responsible for the development of PointClub. I am just giving a review of it, so people can see what it offers. and if it will be worth it for them to join. So can unfortunately not do anything to add more earning methods. I do however know that PointClub is working on continuously introducing more ways to earn, but exactly what kind and when, I do not know. You answered pretty much answered all of my questions, but one. You stated a con of a high threshold amount. Is that $25 an amount that takes a while to reach? Overall a great article with detailed information. Personally, I am heading over there now to check it further. Thanks for all the info. I listed the payout threshold as a con, as it is higher than on many other survey sites. On the other hand it does however have a $5 joining bonus, which is a lot bigger than on most other survey sites. 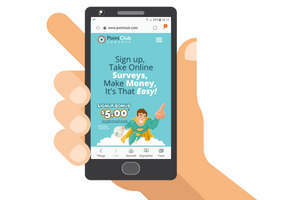 So it gives you a great start, and if you live in on of the countries where PointClub has good opportunities and make sure to login to get the extra bonus, it should not take too long to reach the payout threshold. This is really cool. It has always been a dream of mine to make a full time income online, but like anything worth having, its going to take some work and time. I have been searching up online “how to make money online” and I read article about how you can make a passive income from paid surveys. I think paid survey will be a great starting point for me into making money online which is why I am glad I came across this review. I am most definitely going to check this site out. Great review, very helpful. 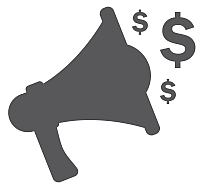 Paid surveys is the easiest and safest way to start making money online, and a great way to have your opinion heard at the same time. And PointClub is definitely a site worth checking out, if you live in one of the countries I mention in the article. Just be aware that online surveys will not be able to make you a full-time income. They can make some nice extra cash on the side, but you should not expect to make a living from it. Just so you do it with the right expectations and do not become disappointed. I am not interested in filling surveys online, as I am only aiming to make passive income online. I have tried one survey site before and the main problem for me is that there were not enough surveys for me. I am from a small country and maybe companies don’t have interest for customers in my country. At first I was OK, with completing one survey every afternoon, but when I started entering my account and seeing no surveys to complete, I completely gave it up. Some countries do unfortunately not have very many survey opportunities. Most countries do however have some good sites, but sometimes they can be difficult to find. If you tell me which country you live in, I will be happy to come up with a few suggestions for the best sites in that country. Either way I hope you find what you are looking for in terms of online income. Then PointClub is not the best site for you to join Ali. You can try sites like ClixSense and Surveytime instead.